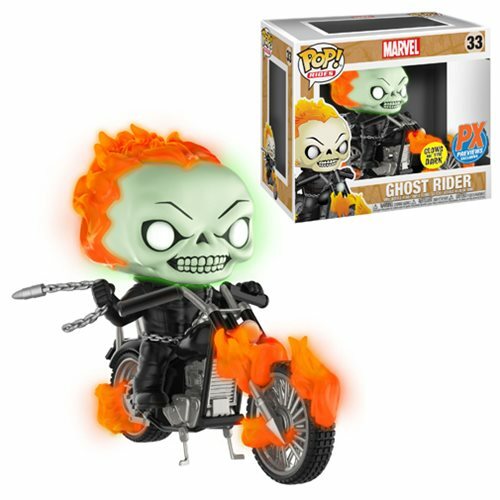 Bring home the cult-favorite Marvel Comics character Johnny Blaze, AKA Ghost Rider, to your Pop! Rides collection! The Marvel Classic Ghost Rider with Bike Glow-in-the Dark Pop! Vinyl Figure - Previews Exclusive depicts Johnny Blaze as Ghost Rider on his flaming motorcycle! Ghost Rider, engulfed in flames, sports Funko's fan-favorite stylized design, and the figure and bike are in scale with the 3 3/4-inch scale Pop! Vinyl figures and comes in window box packaging. Ghost Rider and his flames glow-in-the-dark. Ghost Rider is riding for Hell tonight! Johnny Blaze, a stunt rider for a traveling carnival, sold his soul to Mephisto for the life of his adoptive father, "Crash" Simpson. But any deal with Mephisto is not to be trusted, and Johnny found himself bonded to the demon Zarathos. Now, as the Spirit of Vengeance, he can transform into the Ghost Rider - a flaming skeleton who rides a hellish chopper - to exact the Devil's retribution and send evil souls back to Hell. Ages 13 and up.